Cerulean blue skies, bright sunshine and gentle breezes ushered in the 7th annual GRRI Reunion. The theme selected for this year was �Golden Oldies�. Fifties �Doowop� music provided a nostalgic backdrop for the day�s festivities. 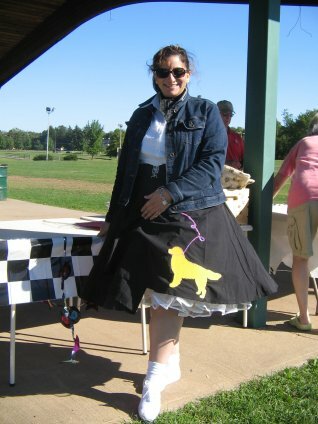 Had there been a �human� costume contest, GRRI volunteer Elaine Furnari would have taken first place in her �modified� poodle skirt � crinoline and all! 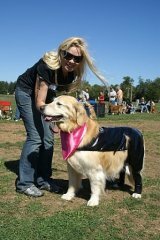 Beautiful Cleo Kazahaya won first place in the �furkids� costume contest sporting her black leather �biker babe� outfit embossed with silver studs spelling her name! Second place went to Rusty �Fonzerelli� Slamp, and third place to Sandy Johnson. 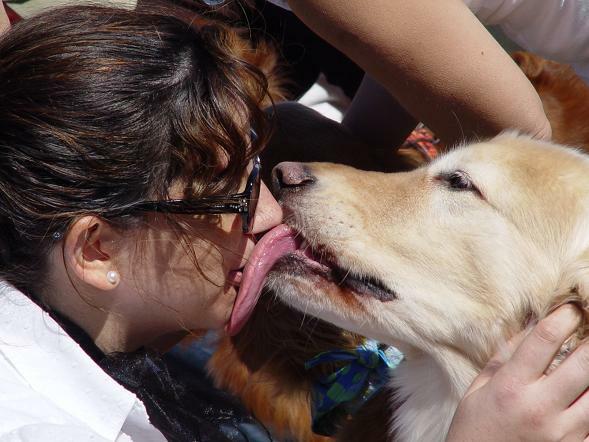 Plenty of canine tongues were wagging as canine and person competed in the kissing contest. First place went to GRRI adopter Pat Bean and her Golden, Chrissie; second place to Matt Veiga and his GRRI Golden, Finn, and third place to GRRI volunteer Drew McFadden and his GRRI Golden, Ryan. But we all unanimously agreed that the best picture of the day was of Elaine Furnari and her Golden, Scout. EWWWW. The hot dog toss was won by Rocky Walter. Toby Meyer won second place and Keara McLaughlin won third. Hannah Heitman, Cody Ready, Ernie Gentile-Geary, Rusty Slamp, Barney Maywald, Casey McFadden, Jessie McFadden, Holly Osman, Sammy Olson, Amber DeSarno, Allie Decina, Julie Ringen, Brandy McLaughlin, Jake Loeffel, Brittney Schurzky, Cody Jorgensen, Harry Potter Roethlin, Rush Bergner, Murphy Collins, Angel Patton and Chrissie Bean. 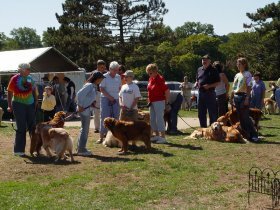 Of course the reunion wouldn�t be complete without the wonderful foods prepared by our volunteers, the sandwiches from Wegman�s supermarket, the raffle baskets, the 50/50 drawing and our merchandise table. GRRI would like to thank John Meyers who won this year�s 50/50 and donated it back to GRRI!